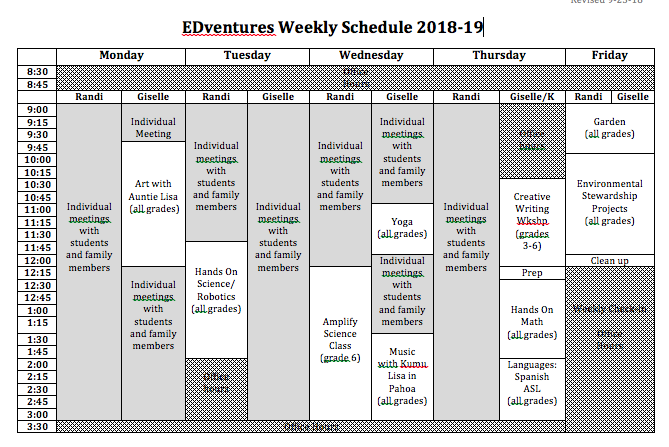 EDventures provides opportunities for hands-on activities, field trips, science labs, environmental stewardship projects, mentoring from older students and more! at least one adult family member is committed to devoting 3-4 hours a day, 4-5 days a week to helping the student learn. Caution: This program is not designed to simply give students material to read or look at online and then expect them to learn on their own. At EDventures, we strongly believe that learning is an active process that requires interaction between people, time and energy to develop ideas, and the chance to explore and make mistakes. Each child deserves a network of support for learning, and EDventures is designed as a partnership between student, adult family member, and teacher to create a learning experience that challenges, enriches, and supports each member of this team. student and supporting family members are excited to work as partners with the staff at EDventures to discover and deliver the best strategies and materials to help the individual child. student is willing to stretch and grow while gradually taking on more responsibility for their own learning. Education at EDventures is NOT a passive process. Below is a short list of items you will want to have for your child this year. Please feel free to let us know if you need support in getting any supplies. We will have basic supplies at our site that will be available to the students, too.